von Willebrand Factor (vWF) is a multimeric glycoprotein that is found in endothelial cells, plasma and platelets. von Willebrand Factor (vWF) is a multimeric glycoprotein that is found in endothelial cells, plasma and platelets. 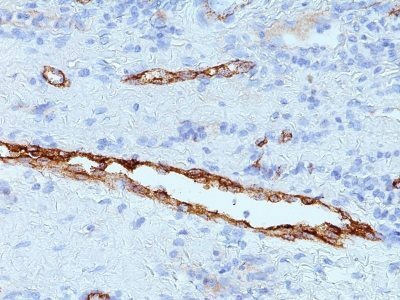 It acts as a carrier protein for Factor VIII and promotes platelet adhesion and aggregation. vWF undergoes a variety of posttranslational modifications that influence the affinity and availability for Factor VIII, including cleavage of the propeptide and formation of N-terminal disulfide bonds. 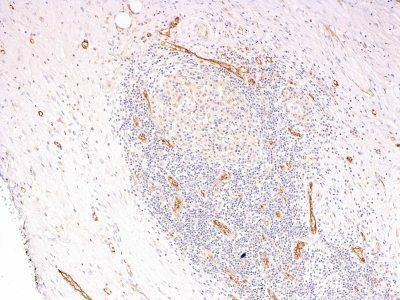 This antibody helps to establish the endothelial nature of some lesions of disputed histogenesis, e.g. Kaposi’s sarcoma and cardiac myxoma. It is widely used for differentiating vascular lesions from those of other tissue differentiation within a panel of other vascular markers although not all tumors of endothelial differentiation contain this antigen. Catalog number key for antibody number 0646, Anti-von Willebrand Factor (3E2D10 VWF635) The prefix indicates conjugation, followed by the antibody number and size suffix.